Mouse Specifics, Inc. is a proud sponsor of the FSH Society Boston Basketball Tournament March 21, 2016, at the TD Garden. The FSH Society is a nonprofit, patient-driven organization supporting research and education for facioscapulohumeral muscular dystrophy (FSHD), one of the most prevalent forms of muscular dystrophy. Founded in 1991 by two individuals with FSHD, Steve Jacobsen and Daniel Perez, the FSH Society is the world’s largest and most progressive grassroots network of patients, families, clinicians and research activists. Among the most prevalent of the muscular dystrophies, FSHD affects an estimated 870,000 people worldwide. Basic research in animal models is crucial to understanding and treating FSHD. Mouse Specifics, Inc. technology has been used in discoveries in numerous preclinical models of neuromuscular disorders, including Duchenne muscular dystrophy, Limb Girdle Muscular Dystrophy, and Spinal Muscular Atrophy. Please consider donating to the FSH to fund important research! 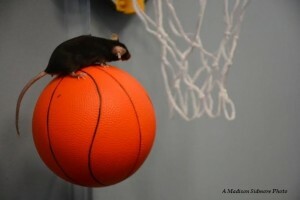 Come to TD Garden to watch the Mouse Specifics team dazzle with our basketball skills on March 21! Any FSH-funded researchers with a mouse model relevant to FSHD are welcome to send us animals for DigiGait Imaging or ECGenie monitoring, as a courtesy to help advance your research.